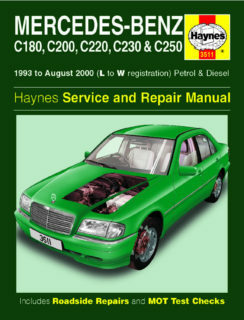 Detailed description of removal, installation, adjustments, repair, overhaul and servicing of all the major vehicle parts (excluding body) including engine, timing belt, fuel system, clutch, brakes, steering, front and rear suspension, transmission, electrical equipment with wiring diagrams, exploded views and complete technical data. 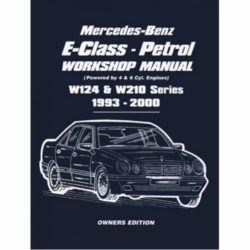 Small though this Workshop Manual is in size, it lacks no detail in covering the whole of the servicing and repair of the Mercedes-Benz vehicles known as "ML-Class" but built in two series. Originally the vehicles were introduced as series "163" manufactured until the end of 2004. The newer series named "164" was introduced during 2005. 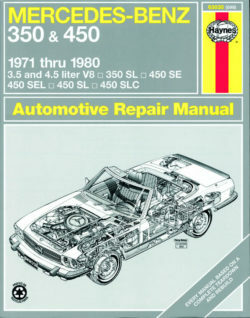 Compiled and illustrated by experts, this manual provides a concise source of helpful Information, all of which has been cross-checked for accuracy to the manufacturer’s official service and repair procedures, but many instructions have derived from actual practice to facilitate your work. Where special tools are required, these are identified in the text if absolutely necessary and the authors do not hesitate to advise you if it is felt that the operation cannot be properly undertaken without the use of such tools. 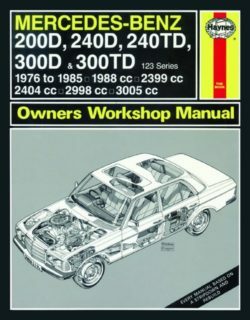 The manual is called “Pocket Mechanic” and produced in a handy glove-pocket size with the aim that it should be kept in the vehicle whilst you are travelling. 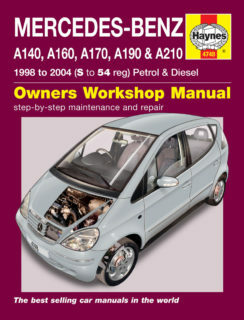 Many garage mechanics themselves use these publications in their work and if you have the manual with you in the car you will have an invaluable source of reference which will quickly repay its modest initial cost. 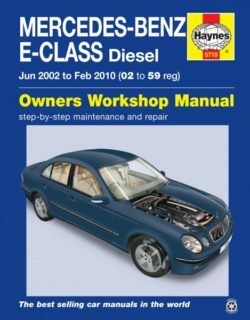 This manual is intended for vehicles built to UK and European specifications with a gasoline/petrol engine unless diesel is specifically mentioned. Whilst many details are useful for the same make and model of car built for other markets, such vehicles may have different features, especially in areas concerned with safety and emission control. 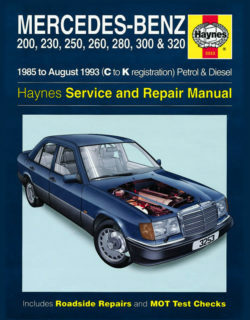 Detailed description of removal, installation, adjustments, repair, overhaul and servicing of all the major vehicle parts (excluding body) including engine, timing belt, fuel injection system, clutch, brakes, steering, front and rear suspension, automatic and manual transmissions, electrical equipment with wiring diagrams, exploded views and complete technical data. 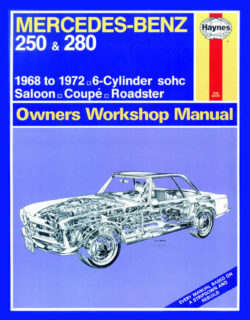 200, 230, 250, 260, 280, 300 and 320 Saloon, Estate and Coupe (124 Series) with rear-wheel drive. Petrol: 2.0 litre (1996cc), 2.3 litre (2298cc), 2.6 litre (2597cc), 2.8 litre (2799cc), 3.0 litre (2962cc) and 3.2 litre (3199cc). Diesel and turbo-Diesel: 2.0 litre (1997cc), 2.5 litre (2497cc) and 3.0 litre (2996cc). Does NOT cover 4-cyl 16-valve or V8 petrol engines. 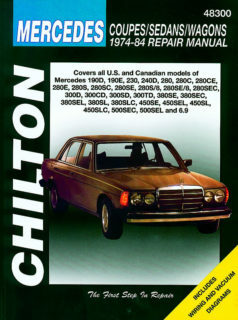 Does NOT cover Convertible, Limousine, 4x4, or E-Class range introduced August 1993. Bakhjulsdrivna modeller med fyr- och sexcylindriga bensinmotorer, och fyr- fem- och sexcylindriga dieselmotorer. 200, 230, 250, 260, 280, 300 och 320, inklusive specialmodeller. 1996, 2298, 2597, 2799, 2962 och 3199cc bensinmotorer. Behandlar ej cabriolet eller Limousinemodeller, ej heller E-klass efter aug 1993. 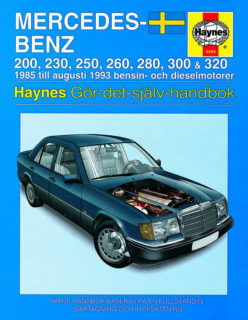 1797, 1996, 2298 och 2597cc bensinmotorer. Behandlar ej 2.3-16 eller 2. Petrol: 1.8 litre (1797cc), 2.0 litre (1996cc), 2.3 litre (2298cc) and 2.6 litre (2597cc). Diesel and turbo-Diesel: 2.0 litre (1997cc) and 2.5 litre (2497cc). Does NOT cover 2.3-16, 2.5-16 or 2.5-16 Evolution. 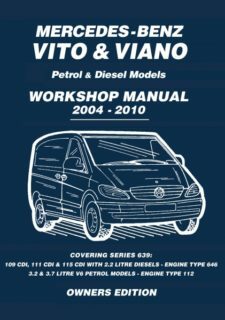 This Workshop Manual covers the following Mercedes-Benz Vito & Viano petrol anddiesel models from the start of model year 2004 to 2010. 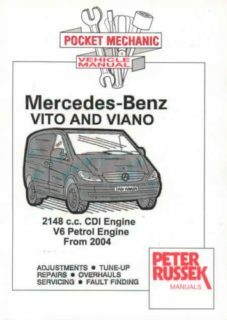 Covered are the Vito petrol models 119, 122 and 123 and the three diesel models 109 CDI,111 CDI and 115 CDI all fitted with the latest common rail 2.2 litre diesel engine (type 112). 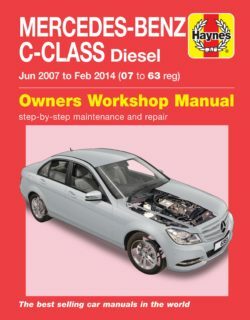 This manual has been written for the practical owner who wants to maintain their vehicle in first-class condition and carry out the bulk of their own servicing and repairs. 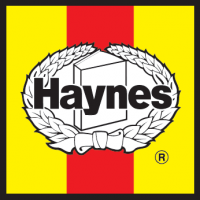 Comprehensive step-by-step instructions are provided for service and overhaul operations. 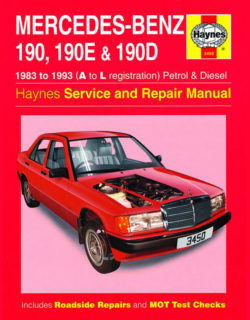 With the aid of this manual many aspects of serice, overhaul and repair are within the scope of an owner with a reasonable degree of mechanical aptitude. Diesel: 2.0 litre (1988cc), 2.4 litre (2399 and 2404cc) and 3.0 litre (2998 and 3005cc). A140, A160, A170, A190 and A210 Hatchback. (W168 series), inc. special/limited editions. Also covers major mechanical features of Vaneo. Petrol: 1.4 litre (1397cc), 1.6 litre (1598cc), 1.9 litre (1898cc) and 2.1 litre (2084cc). Does NOT cover new A-Class range (W169 series) introduced 2005. C180, C200, C220, C230 and C250 Saloon and Estate (C-Class). Petrol: 1.8 litre (1797 and 1799cc), 2.0 litre (1998cc), 2.2 litre (2199cc) and 2.3 litre (2295cc) 4-cyl.Diesel and turbo-Diesel: 2.2 litre (2155cc) and 2.5 litre (2497cc). 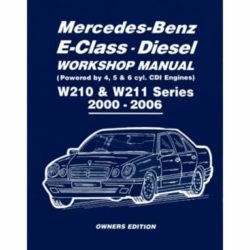 Does NOT cover supercharged (Kompressor) or 6-cyl petrol, C200 or CDI 220 Diesel, or AMG versions.Does NOT cover new C-Class range introduced September 2000. 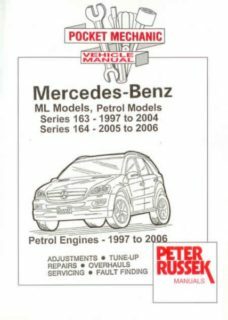 Mercedes Benz C Class W203 models with in-line petrol and diesel engines.C160, C180, C200, C220, C230 and C270 Saloon, Estate and Coupe (W203 series), inc. ‘Kompressor’ models and special/limited editions. Petrol: 1.8 litre (1796cc), 2.0 litre (1998cc) and 2.3 litre (2295cc). Turbo-Diesel: 2.2 litre (2148cc) and 2.7 litre (2685cc). 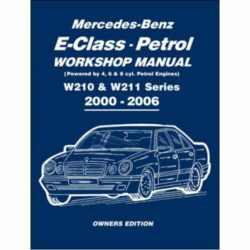 This Owners Edition Workshop Manual covers the Mercedes-Benz E Class Petrol W210 & W211 Series from 2000 to 2006, fitted with the 1.8, 2.0, 2.6, 2.8, 3.2, 3.5, 4.3 & 5.0 Litre, 111, 112, 113, 271 & 272, with four, six & eight cylinder petrol engine. It has been specially written for the practical owner who wants to maintain a vehicle in first-class condition and carry out the bulk of his or her own servicing and repairs. Comprehensive step-by-step instructions are provided for service and overhaul operations to guide the reader through what might otherwise be unfamiliar and complicated tasks. Numerous drawings are included to amplify the text. Covering: Mercedes-Benz E200, E240, E280, E320, E350, E430, E500. With 190 pages, well illustrated. SB. 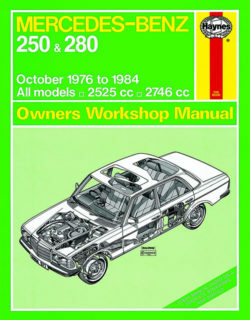 Audi workshop manuals are A5 in size (14.8cm x 21cm) and professionally printed and bound in the UK. Petrol and Diesel from 1979 300 G, 240 GD, 230 G, 280 GE, 230 GE, 250 GD, 300 GD. 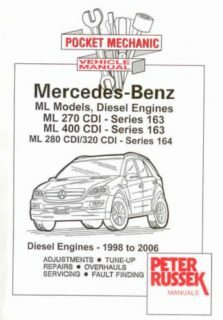 Detailed description of removal, installation, adjustments, repairs, overhaul and servicing of all the major vehicle parts (except body) including 602, 603, 617 and 617 diesel engines, M102, M115 and M110 petrol engines, valves, carburettor, petrol and diesel injections systems, clutch, drive shafts, front and rear suspension, brakes, steering, manual transmission (except overhaul), engine electrics with wiring diagrams, exploded views and complete technical data. 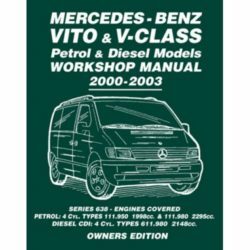 Small though this Workshop Manual is in size, it lacks no detail in covering most of the servicing and repair of the Mercedes-Benz vehicles known as "G-Models", introduced during 1979 with either petrol or diesel engines. In certain countries the vehicles are also known as "Puch G". Petrol M - 102, 110 & 115 4 & 6 Cyl. Diesel OM - 602, 603, 616 & 617 - 4, 5 & 6 Cyl. 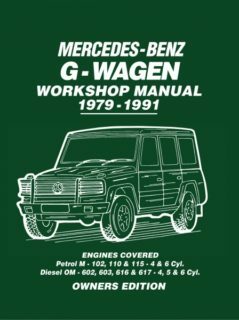 This ‘Owners Edition’ workshop manual covers the Mercedes-Benz petrol and diesel powered vehicles known as the G Class or ‘G-Wagen’ short for Gelandewagen (or cross country vehicle. The G-Wagen was initially developed as a military vehicle from a suggestion by the Shah of Iran, with the civilian version being introduced in 1979. 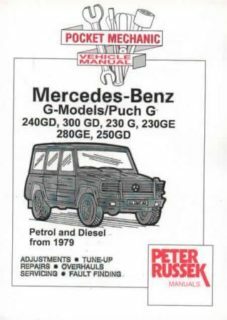 Universally known as the G-Wagen, it has also been sold under the Puch name in certain markets. It contains comprehensive step-by-step instructions to enable the owner to carry out the bulk of their own servicing and repairs. With easy-to-follow instructions and hundreds of illustrations to amplify the text, many aspects of service, overhaul and repair are within the scope of an owner with a reasonable degree of mechanical aptitude. 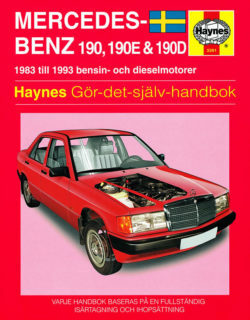 21 Chapters include Cooling System, Clutch, Manual Transmission, Front & Rear Suspension, Steering, Brakes, 602 & 603 Diesel Engines, M115, M102 and M110 Petrol Engines, Electrical System, Wiring Diagrams, etc. Mercedes-Benz Sprinter: van, chassis cab and bus derivatives in short-, medium- and long-wheelbase configurations.Diesel: 2.2 litre (2148 cc) and 2.9 litre (2874 cc). 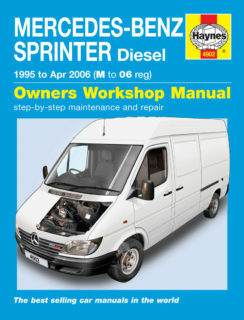 Does NOT cover new Sprinter range introduced May 2006.Does NOT cover petrol models, 2.3 litre or 2.7 litre diesel models, 4x4 models or specialist bodywork conversions. Covered is the petrol model 113 with 95kW (engine type 111 ) and the two diesel models 108 and 110 , both with the well known 2.3 litre 601 engine. Depending on the version the engine has a performance of 58kW, without turbo charger or 72 kW with turbo charger. In Sections 0 and 1 you will find further details of the various models and engines.Brief, easy-to-follow instructions are given, free from all necessary complications and repetitions, yet containing all the required technical detail and information, and many diagrams and illustrations. 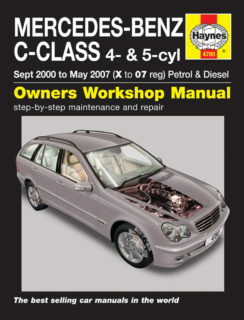 Compiled and illustrated by experts, this manual provides a concise source of helpful information, all of which has been crosschecked for accuracy to the manufacturer's official service and repair procedures, but many instructions have derived from actual practice to facilitate your work. Where special tools are required, these are identified in the text if absolutely necessary and we do not hesitate to advise you if we feel that the operation cannot be properly undertaken without the use of such tools. With 206 fully illustrated pages. SB.